Nature lovers consider this southeast area of Cuba a place well worth visiting, in order to admire its almost virgin forests, blue, clear water beaches, lakes and caverns and natural pools. Thirty percent of the native fauna live here, while of the 171 species of birds, 18 are native to the island. There is also a great variety of crocodiles, reaching some 15 000 individuals, as well as the manatee, considered a jewel of the national fauna. The International Bird Observation Centre (Centro Internacional de Observación de Aves) is located at Playa Larga, with some 400 metres of warm water with coral bottoms and natural trails. The tourist centre of Guamá, is an aborigine construction where the work of the famous Cuban sculptress Rita Longa can be appreciated in all its magnitude. 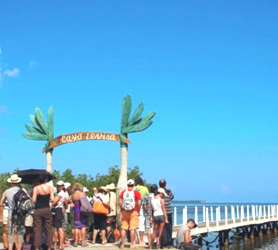 Giron Beach (Playa Girón), in 1961, marked the defeat of the mercenary troops paid by the United States who invaded Cuba here.